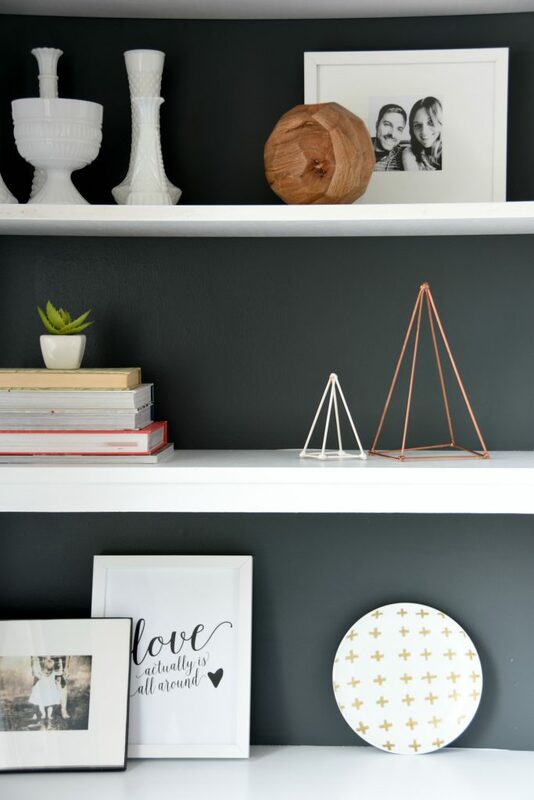 I have a really fun little DIY for you today that is going to amp up your #shelfie game to a whole new level. 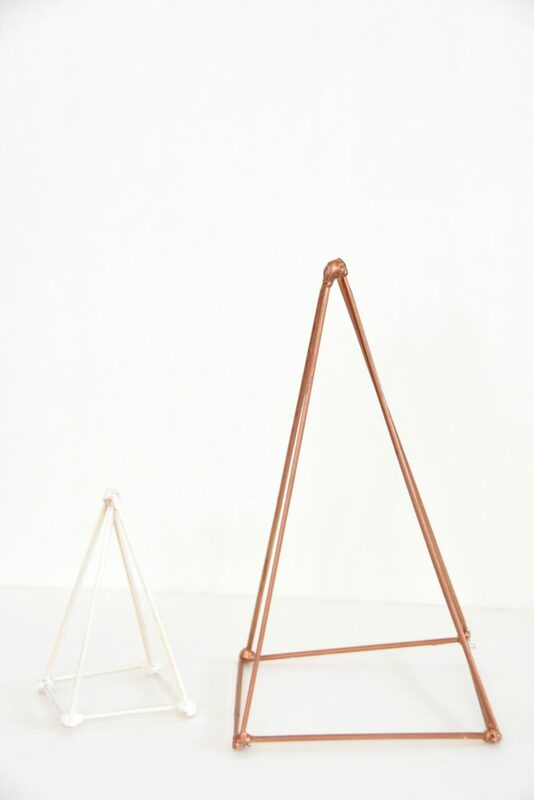 I’m sure you know how hot geometric sculptures are right now – particularly in any kind of brass or copper finish. Love, right? Well, here a DIY version that you can make for next to nothing. The list of supplies and tools is short and sweet. They are all things that you probably already have around your house. Ain’t that the best? It’s a little hard to write out the description for this one, so just bear with me and make sure you refer to the photos below to take you through it. 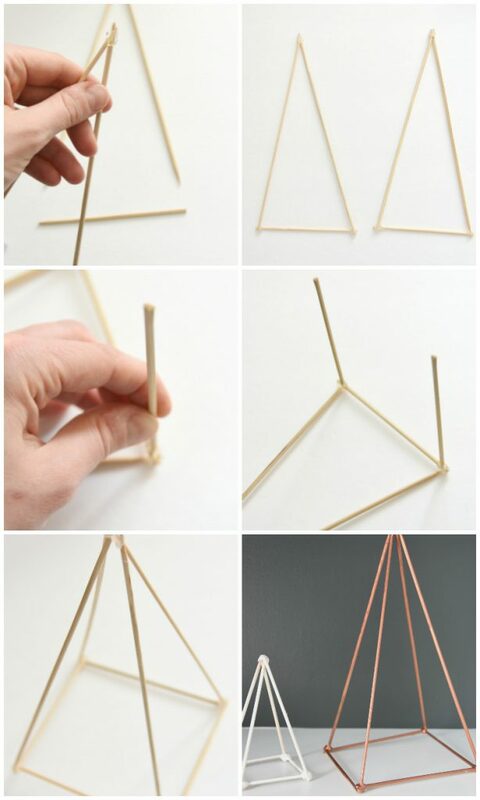 Step 1 // Cut your skewers so that you create triangle shapes (2 long pieces + 1 short piece = triangle). Do this to create two triangles. Step 2 // Attach the two long pieces together at the top using hot glue. You need to put on a big glob of the glue and then hold them together for a good 30 seconds before it dries. You can go over it with some more hot glue if needed to make sure they are really stuck together. Now glue the short piece across the bottom. Repeat to form your second triangle. Step 3 // Lay your triangles down on the ground and cut 2 more short pieces. These are the pieces that are going to connect your two triangles, and turn this into a three dimensional structure. 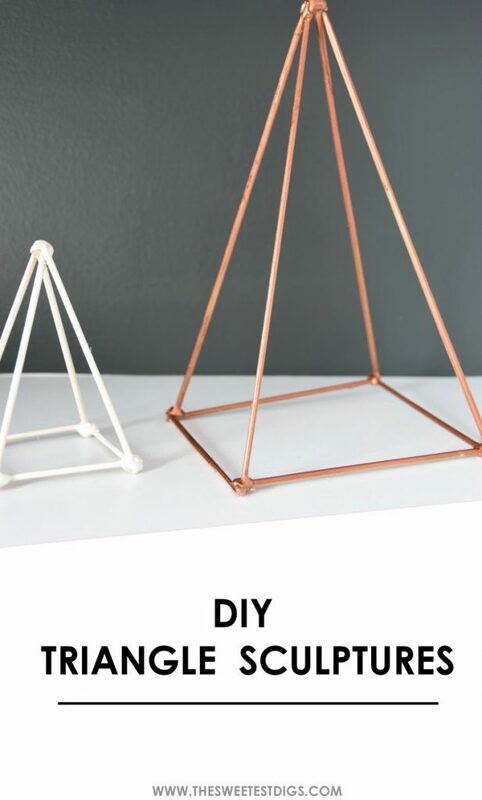 Glue each short piece to the base of 1 of your triangles, so that they are standing up (see middle pics). Again, you need to hold in place as the glue dries. Step 4 // Glue the ends of the standing up pieces to the base of the second triangle. Then glue the tops of the two triangles together so that it creates the completed shape. Last step is to spray paint them when the glue has had a lot of time to dry. Don’t stress about if the glue looks globby, because once it’s spray painted you don’t really notice. 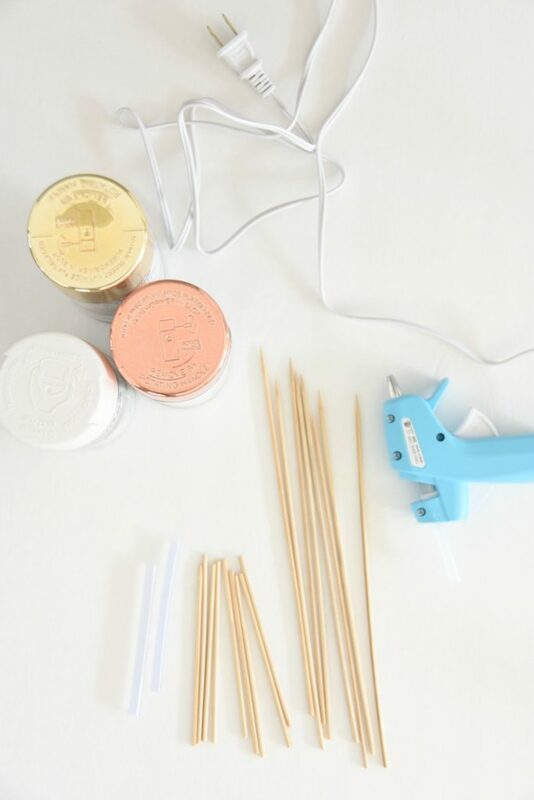 It’s kinda like one of those projects you would do in elementary school with marshmallows and toothpicks, right? Ha. 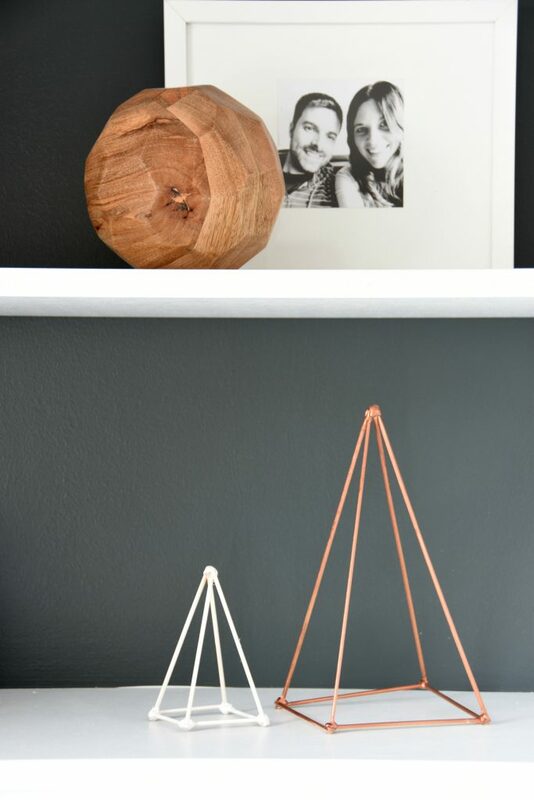 BUT these bad boys totally amp up your shelf styling game. Don’t they look good for a couple of skewers and hot glue? For reals. I like how they work with the other brass and white elements I have going on on in the living room built-in’s. As I have come to learn with styling shelves, it’s all about creating an overall palette and then sticking within it. Instead of just throwing up everything you like, try to adhere to an overall color theme. And another tip? Edit. This is always what I struggle with. I put up way too many things and then need to pare it down. Seriously, you can go from crazypants to sophisticated pretty easily by just removing items. Been there! Want to get the same brass+white+wood look I have going on here? I rounded up some accessories from Target, who are always on trend at a price point I can handle (PS. did you hear they ship to Canada now?! Halle-friggin-lujah!). I’m *OBSESSED* with those agate bookends. What about you guys? Are you constant shelf tweakers like me? Ever made anything other than food with skewer sticks? Haha!